This small wooden quadrant bears hour lines depicted on one face, together with the signature Joseph Pinam, about whom we have no information. A wind rose is depicted on the other face. The instrument could be used to tell the time, by measuring the height of the sun. A plumb-line, now missing, was originally fixed to the corner. The quadrant was tilted while the sun was being observed through it, allowing its height to be displayed. The time could be read from the corresponding hour line. 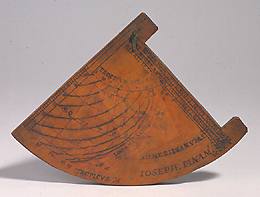 This solar quadrant belonged to Vincenzo Viviani, Galileo's last disciple.